Clarksville, TN – Get ready for the battle of the sexes as only the greatest playwright of the English language could tell it! William Shakespeare’s “The Taming of the Shrew”, playing five public performances in April at the Roxy Regional Theatre, follows the comic courtship of Petruchio, a gentleman of Verona, and the headstrong Kate, who must marry before her more popular sister, Bianca, may be wed. Starring Margaret Eilertson as Kate and Jonathan Whitney as Petruchio, “The Taming of the Shrew” features Emily Rourke as Bianca, Jay Doolittle as Baptista, Zak Schneider as Lucentio, Michael Klug as Gremio, Scott Watson as Hortensio, Michael C. Brown as Tranio, Jackie Ostick as Grumio, and Leslie Greene as the Widow. “The Taming of the Shrew” stars Margaret Eilertson and Jonathan Whitney. “The Taming of the Shrew” has been the subject of numerous adaptations, one of the most famous of which is the 1967 film starring Elizabeth Taylor and Richard Burton. Cole Porter’s musical Kiss Me, Kate, which premiered on Broadway in 1948, was also based on Shakespeare’s comedy. With a script edited by Tom Thayer, John McDonald and Leslie Greene, and directed by John McDonald, the Roxy Regional Theatre’s production of “The Taming of the Shrew” will be presented in modern dress to place emphasis on the words rather than elaborate costuming. Wednesday, April 6th, is the theatre’s traditional pay-what-you-can preview. All tickets not pre-sold at the regular ticket price will go on sale at 6:30pm that evening for a $5.00 minimum donation. 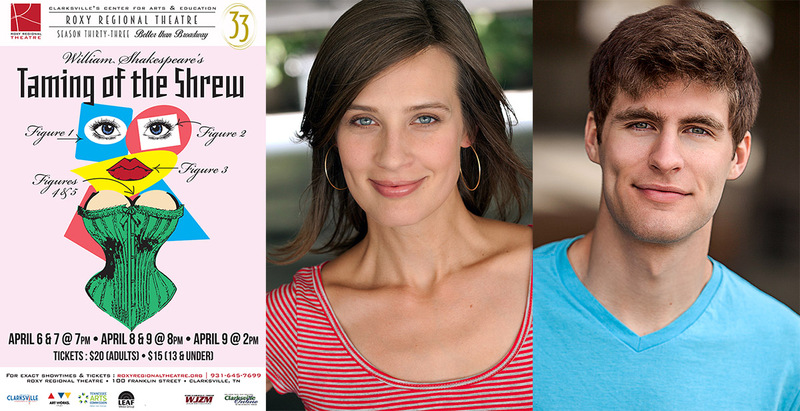 “The Taming of the Shrew” plays April 6th and 7th at 7:00pm, April 8th at 8:00pm, and April 9th at 2:00pm and 8:00pm. This production is made possible in part through the generous support of the City of Clarksville and Jim B. Marshall. Additional funding support has been provided by Nancy Ladd and Dr. John & Cathy Stanton.